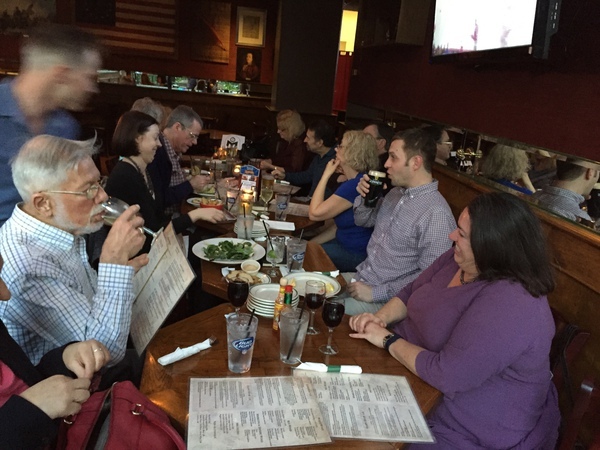 There aren’t enough Mensa events in San Francisco, so we’ve set up a monthly event: a weeknight get-together at a downtown San Francisco bar/restaurant. Everyone is welcome, but an RSVP helps in determining how large of a table to reserve. The Holding Company in San Francisco. They are located in Embarcadero Center #2, on the 3rd (top) floor (Sacramento St. between Front Street and Davis Street). The Holding Company is a great place to get together. The waitresses are friendly, the prices are reasonable, and best of all, they rarely get crowded or loud. That way, we can hang out and talk without having to shout at each other to be heard. They have a Happy Hour until 7pm, although it only provides for a relatively small discount and have a wide selection of beers, mixed drinks, non-alcoholic drinks, and food. The place is walkable from BART and the Financial District, and there is an underground parking garage at Embarcadero Center with validated parking for those who are driving. You can stop by after work, or, if you don’t work downtown, just come anyway. All Mensans (and guests) over 21 are welcome. This outing will be will be held every 3rd Wednesday of the month, starting at 5:30pm. Arrive when you can, and leave when you’re ready…we should be there until at least 8:00pm. You’ll recognize our group by the Mensa logo that I will have on top of our table. If you’re a member of Mensa’s Meetup.com group, please RSVP at www.meetup.com/sfmensa if you’re planning on coming. If you’re not a member of Mensa’s Meetup.com group, I encourage you to join, and then RSVP for this event after you’ve been approved. Ours is a private group, for Mensa members only, so no need to worry about privacy considerations. Just go to http://www.meetup.com/SFMensa and click on “Join Us”. If you absolutely don’t want to join Mensa’s Meetup.com group, then RSVP via email to Barry Krasner.